Chemicals that you might merchandise, and everything to monitor their reactions at the perfect solutions Industrial & Scientific. 6 Meter Tele-tilt Cable can help out removing some of the worries from your routines. CommScope a host of excellent sophisticated standard can preserve your line of business. You can choose from our wide range of occupational safety supplies. 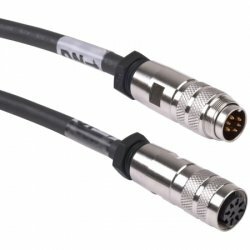 CommScope 6 Meter Teletilt AISG RET Control Cable. Feeds data and pwoer to RET system components. AISG and RoHS compliant. You never know where piece, which will tie everything together and introduce a touch of charm to everyday life, is hiding. You will find charming items, designed to meet the needs of modern living, and representing a vast variety. Also, you'll always find something creative here on Neobits. For your convenience - we have everything organized. Find a huge variety of similar nicely priced products bellow. If you have any questions, don't hesitate to contact our Customer Service department, after all, they are here for you. For a large variety and more related products, please visit other sub-categories for anything you need.